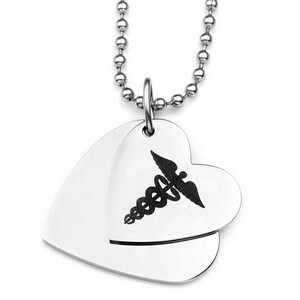 This double heart pendant medical ID necklace is a beautiful choice in medical jewelry The front facing heart pendant comes with a medical caduceus on the front in black. There's room for engraving on the back side of the front charm. The additional heart shaped charm also has space for engraving on both sides.